New Beginnings is always in dire need of wonderful people with a heart for our mission. With more front desk and lay counselor volunteers, we can add more days and hours and see more people. Everyone’s time is valuable, and we all seem to be working hard these days and much longer hours than in the past. It’s hard to find more time in our busy schedules. Could you give just a few hours? We are always in need of someone to help make copies, file, organize, answer phones, do reception work, help keep the Center clean, clean and sort through donations for our Parenting Shops, organize material, write questionnaires for homework, manage the books in our small library, do data entry work, contribute articles and videos to our website and Facebook page, etc. Are you a mom of multiple children who has a wealth of parenting knowledge to share? Maybe you would love to mentor a new believer through their journey with Christ. Do you have experience at an abortion clinic and would like to personally share that experience? Perhaps you have a heart for helping someone with abortion recovery. If any of these situations sound like you, then we NEED YOU! A lot of people shy away from volunteering at a crisis pregnancy center, because they think that abortion is controversial or they wouldn’t know what to say to someone considering an abortion. The abortion vulnerable client is only one type of client we see. Just remember: we are not a political organization. We are here to love, support, and help people. If God has placed you in New Beginnings, He will also give you the words and heart for the people you counsel. Most clients want to carry their baby to term and parent to the best of their ability. Counseling is all about you and your life experience. We all have gifts to share. Please prayerfully consider becoming a volunteer for New Beginnings. You can pick up an application at the Center or call us at 928-474-7466 to speak with the Director about volunteering. 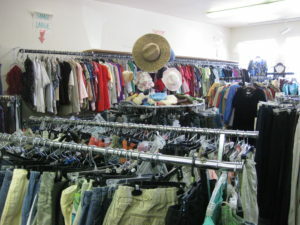 We also desperately need volunteers at The Nook, a new and resale store located at 408 W. Main St., Suites 4, 5, and 6. We are open Tuesday through Friday 10-4 and Saturday from 10-2. We offer several lines of new items that make great gifts. 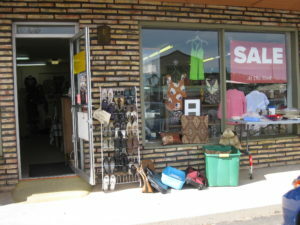 We also offer resale items including clothing, house wares, books, furniture, etc. Come in and see what we have! Click HERE to find us on Facebook. The Nook welcomes all donations. Cleaning out your closet or home? All donations are tax deductible, and all proceeds benefit New Beginnings Pregnancy and Parenting Center. If you can devote a few hours a week, the Nook needs help with duties such as sorting donations, tagging and pricing, running a cash register, making displays, organizing, cleaning, steaming clothes, providing customer service, and promoting New Beginnings to the public. We also occasionally need someone with a pick-up truck and helper to pick up furniture donations. Many thanks to all of the churches, businesses, and individuals who financially support New Beginnings. We survive on your contributions, fund-raisers, as well as the proceeds from The Nook. 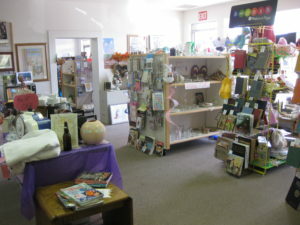 Thanks to the people who donate new and used items to The Nook. We receive such beautiful things there, and we truly appreciate it! We also thank all of the people who make quilts, bibs, caps, booties, blankets, and burp cloths. Our clients love to receive these pretty handmade gifts from you. Your purchases go directly to support our programs at New Beginnings. Thanks to everyone who donates baby clothes, furniture, diapers, and miscellaneous baby items. Thank you to our volunteers. You make this place special. You show up week after week, year after year, to share your life and love with the clients. Thanks to the prayer warriors, who pray for this ministry. Thank you for wearing your precious feet pins, and for reminding us why we do this work. Please pray for the Center and our volunteers. It is our goal every day to plant a seed. We provide the compassion needed to come alongside moms and dads in their fight to be the best parents they can be. Pray for us as we answer their questions, listen to them cry, and provide a place they know they can depend on. Pray that we share the love of Jesus through words and behavior. For some of the unborn, this is a place where their mom made the decision for Life! For some moms and dads, this is the place they come when they are stuck at a crossroads as a parent and need someone to talk with and seek counsel. For young teens, they learn that their bodies are a gift for their future spouse, and they are worth waiting for. Whatever their reasons…the people keep coming and seeking, and it is so important that New Beginnings will always be here as a place to meet their needs. Thank you for reading and taking the time to learn about us.